Starting today, I chronicle my Journey through the United States. In the one month that I was there, I tried to see and experience as much of its urban sprawl as well as wilderness as I could. We start with what to me was the High point of the trip. There are some things that can never be fully explained in words. They have to be seen, felt and experienced and then stored in memory as an experience that is inspiring as well as curiously humbling. The Grand Canyon is one of them. This was a trip I almost gave up on. It was difficult to plan thanks to the fact that the United States is not kind to visitors who don’t want to drive. 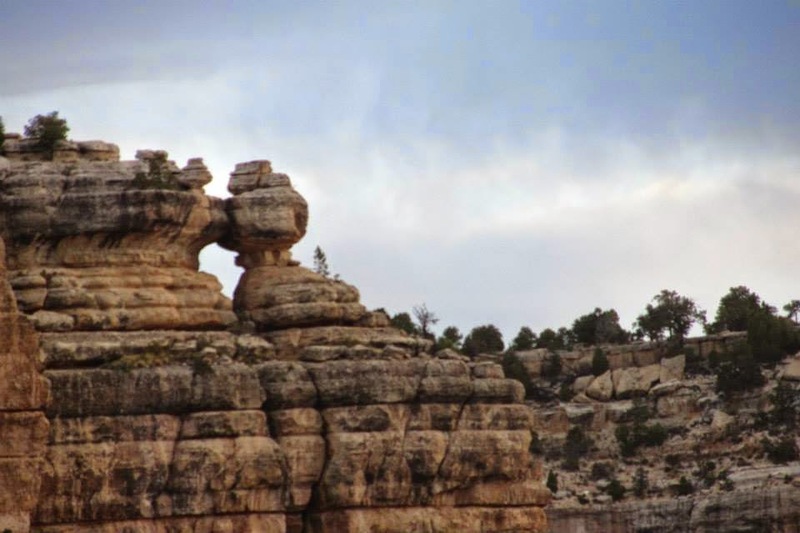 The connections from San Francisco to Flagstaff – the closest airport to Grand Canyon, were erratic and even more tedious was the three hour wait at the airport for the bus that took me to the Canyon. But in the end it was worth it. It was so worth it. The last leg of the journey, the two hour bus ride seemed as if it would never end. The afternoon sun beat down cruelly on the empty road stretching in front of me. The desert like scenery outside complimented the heat. Miles and miles of dry land interspersed with rocks rising like humps on some giant animal. The roof of a distant farm shimmering in the heat or the occasional car on the highway was the only sign that the place was inhabited. Finally we entered the Grand Canyon National Park and I was dropped off somewhere near the visitors center. Then began the long walk in the unrelenting heat to my lodge. By the time I reached the lodge, checked in and then walked down to my wooden cabin I was so hot and worn out that I barely spared a glance at the Canyon I could see dimly out of my window. But by evening it was pleasant and a cool breeze had sprung up. The canyon beckoned tantalizingly. I walked out of my cabin, turned a corner and then stood utterly transfixed. 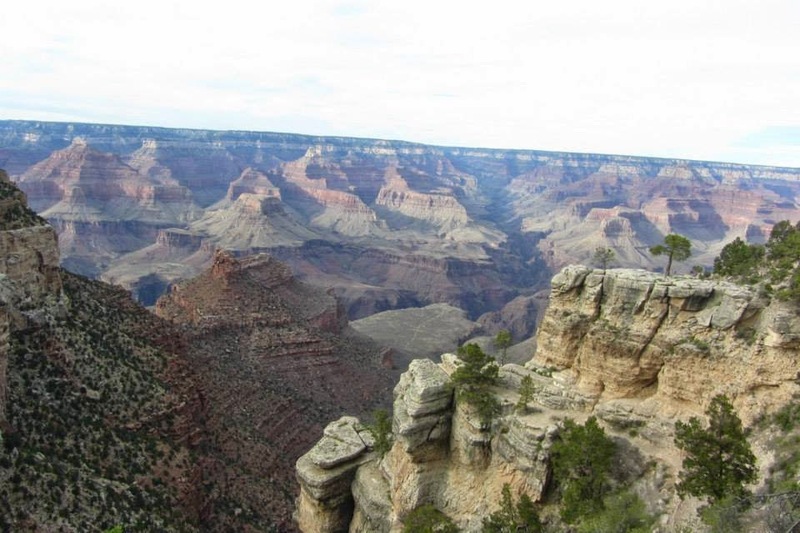 The Grand Canyon lay in front of me, staggering in its sheer size and magnitude. 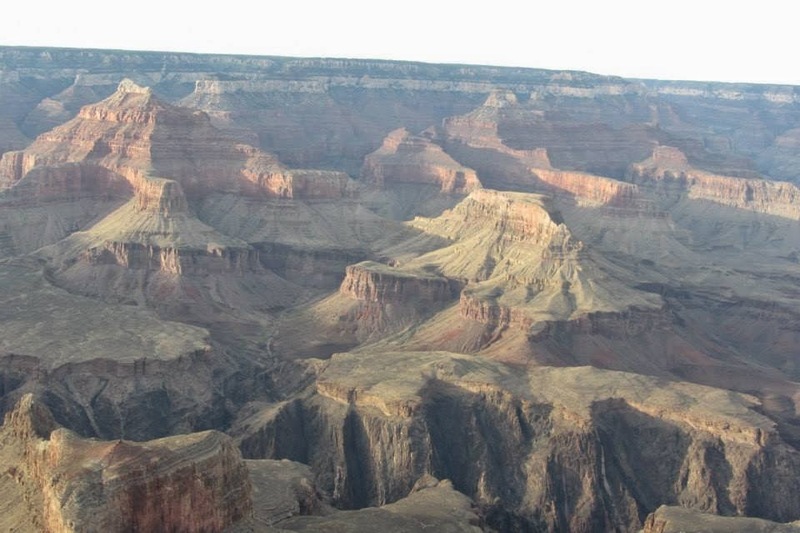 The Grand Canyon is 446 km long and about 29 kms wide. Over centuries the Colorado river has cut through layer and layers of rock to form such a deep gorge that the current depth of the canyon is an astonishing 6,000 feet. 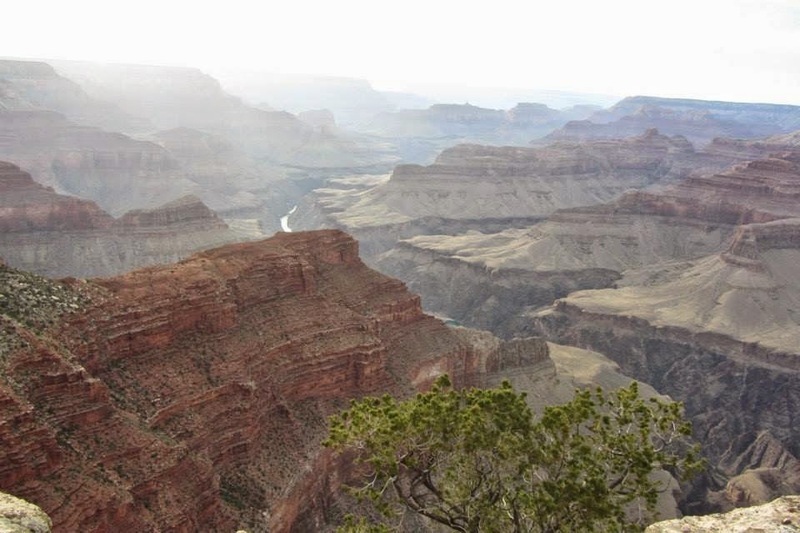 Seen from the rim of the Grand Canyon, the river is nothing but a slim silver ribbon. Most of the Canyon is nothing but rock with a few trees jutting out here and there. The different colors and hues of the rocks make the canyon seem like a gigantic palette over which rust, grey, red and black colors have been strewn indiscriminately with just a dab of green here and there. The layers upon layers of rock that the river has cut through have survived almost perfectly over the centuries. The exposed layers look like pages of an open book, in this case each page preserving a million years of history in it. 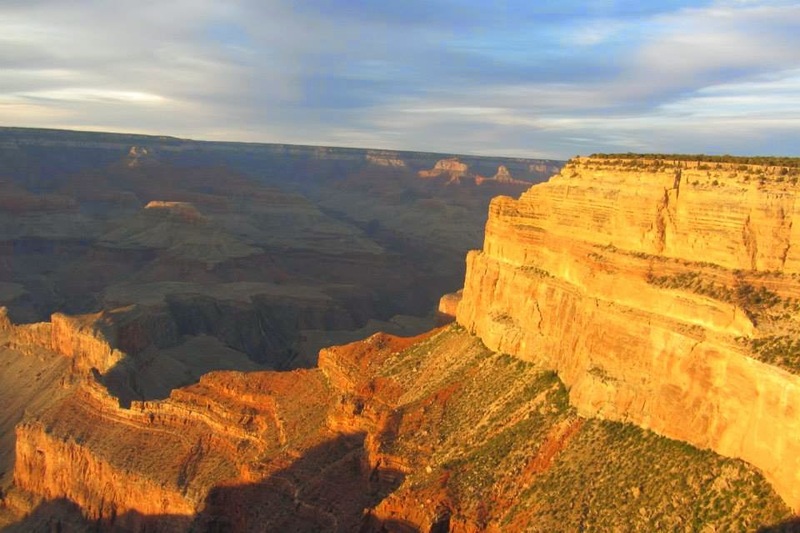 Mighty and magnificent, imperious in all its grandeur, the Grand Canyon is undoubtedly one of Nature’s greatest creations. But in no way is the beauty of the canyon gentle and soothing, rather its mute power is almost palpable. The evening sky was dotted with clouds. I was disappointed. I had hoped for a clear sky because I had heard so much about the spectacular sunset at the canyon. But the clouds added their own magic to the sunset. The clouds seemed to be in a turmoil, but beneath them the sunset was peaceful ! curling down to the river as sinuously as snakes. I chose The Bright Angle Trail – one of the easiest and most frequented. I started my trek at 4 am. The light was still dim and the air still held the coolness of the night in it. 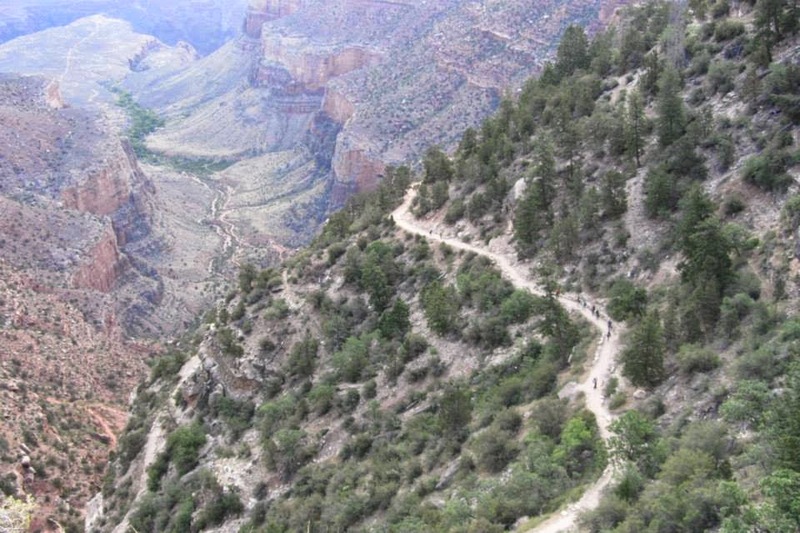 Although standing at the rim of the Grand Canyon offers you a panoramic view, its walking the trails that give you the smaller delights. Like this curiously shaped rock. 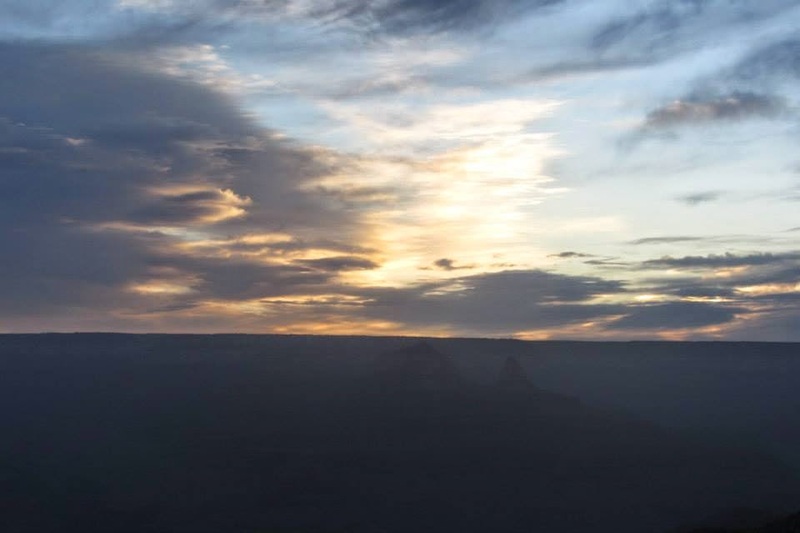 Finally when pale peach and pink streaks had started spreading through the horizon like tendrils, I sat down on a massive rock jutting out over the canyon and waited for the sun to rise. 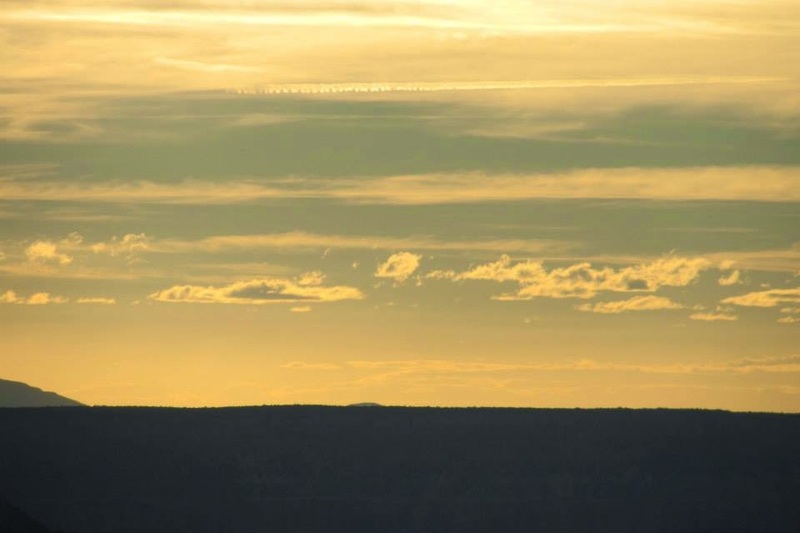 It began with the sun touching just the tip of the canyon with gold, like a fussy painter testing his colors. Slowly the color spread over the entire canyon as though it’s on fire. The entire canyon was a brilliant shimmering gold. The surroundings were so hushed and peaceful, I could actually hear the leaves on the lone tree nearby fluttering in the slight wind. For me, God is not to be found in temples and idols. For me he exists in the magnificence of nature, and sitting on that rock, watching the sun rise over the Grand Canyon, I somehow felt more closer to him than I ever have. Wow!! loved the description and the pics. I am eagerly waiting for the other posts about the other delights of your trip. keep them coming!! Thank You Kanchana. Glad you like the post. I have a few more travelogues in the pipeline. Go go go ! This place is really something else ! Lovely pictures to accompany the post, Ruchira! Thank you Kajal. I wanted to make it as descriptive as possible because I wanted to show my readers how I felt. Yes I do feel closer to God when I am in Nature. Oh I love the Grand Canyon. But I did not do the trail back then. It is awe inspiring and yes it is majectically overpowering. Luckily, we had our car else going to place in US can be a real pain. Looking forward to reading more of the trip from you, Ruch! Majestically overpowering is the word Rachns. Yes my only complaint about US is the lack of Public Transport ! And I have never been to the Rockies. That is something I want to do once in my life. Welcome here Rajrupa and thanks for reading. Beautifully captured by your camera. But more so by your prose! Thank you so very much Rickie ! I agree nature can be tantalizing and the amount of energy it possesses is mind blowing thus, the practice of Reiki myself. Looking fwd to seeing/reading more of your US experience. cheers! Thank you so much Jairam ! Ah, looks amazing! Your description makes one live the experience themselves. I've been to this place called Oravakallu Rock Garden - it is a Mini grand canyon of sorts, like maybe 1/100 of the actual thing, but the first sun rays hitting the rock formations and turning them into shining gold is still a view to behold. It was magical! I can imagine Nandana ! It must have been truly magical. Wow beautiful description and equally striking pics! Did you go to East Coast too? I'm visiting NY next week...my maiden trip courtesy Hubby's office :) so excited! Aditi, yes I did. I went to NYC and absolutely loved it ! I am sure so will you ! Thank you so much Ghata. Glad you liked it. It is truly beyond words. The last picture bathing in golden light is breathtaking. Thank you Alka. The sun rise was indeed phenomenal ! That was beautifully described.. did you get to visit the village of natives which is nested in its basin? Seeta, I wanted to visit the village very badly but there wasn't enough time ! Thank you so much Vinodini and welcome here ! amazing description. Those last lines just touched me ! what a write up. Waiting to read more america's travelogues. U know what Grand Canyon reminds me - 127 hrs movie :) I was so scared watching it and felt they must be very eerie but true GODLY experiences happen at such mysterious places. Thank you so much Afshan. Grand Canyon can be intimidating but it is also incredibly beautiful. I love your description, Ruchira! I have been there a number of times in different seasons, and you're quite right! And, I agree with your statement that God resides in Nature and not in temples and monuments! Oh yes Roshni. I have always found my God in Nature ! Thank you Nabanita. You saying that this post makes you feel peaceful makes me so happy. Brilliant description ! Loved the virtual tour of the Grand Canyon ! 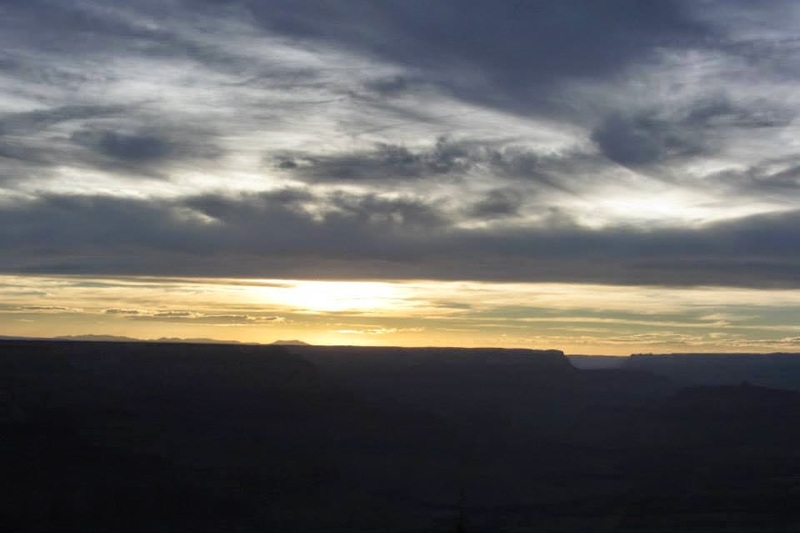 The picture of the canyon at sunrise is simply amazing ! Thank you moonstone. Watching the sunrise was an amazing experience. And welcome here ! I so want to visit the grand canyon , actually we had a plan this year in july to meet in chicago and then ride to it .. but it did not materialise as I had my graduation and projects to submit .. maybe some time later this year or 100% next year ..
You must visit it. Its fabulous ! Oh wow you are having such a fantastic trip!!!! The diversity in America's topography is astounding. From lush greens, to statuesque mountains, to the towering trees, to the winding roads that run along the ocean - you never know what to expect. Reading your travelogues is a sensory delight. You don't narrate, you make us experience the place. Loved it. You are right. The topography there is indeed astounding. Thank you so much for liking the post. I loved the way you said sensory delight. Thank you ! It must have been a life time experience. The sun set is the best part.